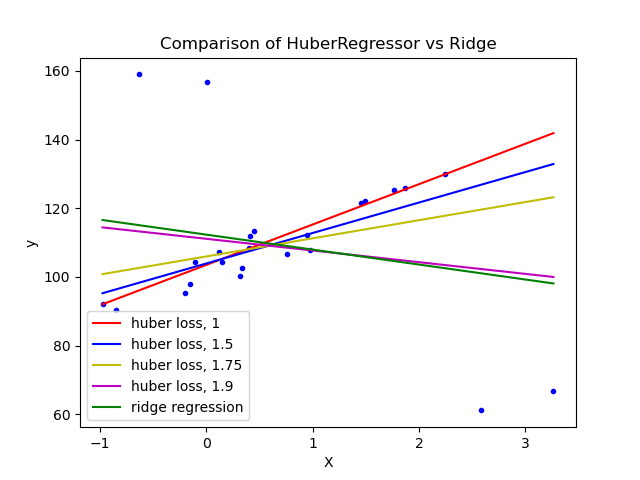 Fit Ridge and HuberRegressor on a dataset with outliers. The example shows that the predictions in ridge are strongly influenced by the outliers present in the dataset. The Huber regressor is less influenced by the outliers since the model uses the linear loss for these. As the parameter epsilon is increased for the Huber regressor, the decision function approaches that of the ridge. # Add four strong outliers to the dataset. X_outliers[:2, :] += X.max() + X.mean() / 4. X_outliers[2:, :] += X.min() - X.mean() / 4.
y_outliers[:2] += y.min() - y.mean() / 4.
y_outliers[2:] += y.max() + y.mean() / 4. # Fit the huber regressor over a series of epsilon values. # Fit a ridge regressor to compare it to huber regressor.